'Despite Roberts’ performance moniker, Little Strings, the sound is anything but diminutive - the artist manages to generate a surprising amount of volume with her ukulele and strong vocals.’ - Duncan Rieder, North Wales Pioneer. ​- Karl Steel, Cumbria Live. ​- Duncan Rieder, North Wales Pioneer. 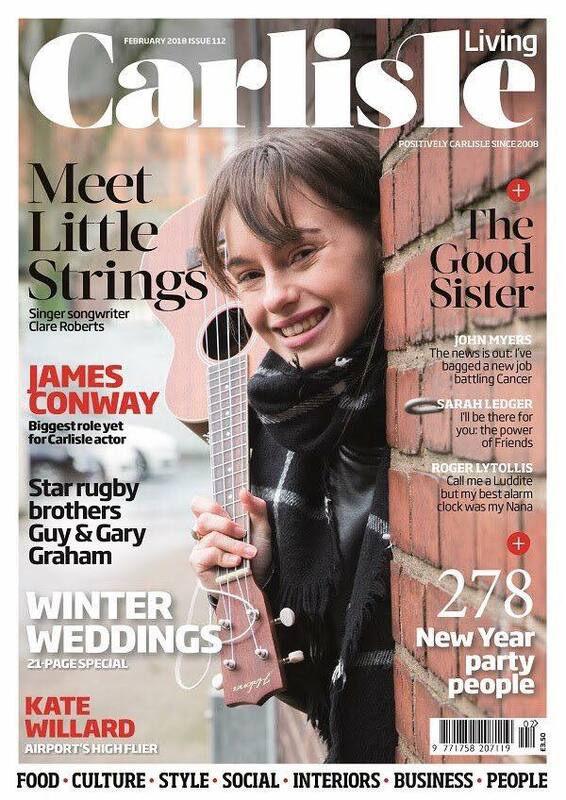 Little Strings on the Cover of Carlisle Living magazine February 2018. ​Little Strings is an international s﻿﻿﻿inger-songwriter and recent competitor in the Ukulele Festival of Scotland's'Rising Stars' competition. She writes Indie-Folk/Pop songs about the people and happenings around her on the ukulele, piano and occasionally various shaky things, performing in venues from Cumbria to Belgium. She is from the UK and has just finished touring Europe doing theatre and music. Little Strings has a new EP out, available online and on CD now. Her singing career started at a young age, singing in hotels and Welsh choirs, competing in National singing competitions such as the Eisteddfod.. She is a lover of authentic music and creating beautiful moments for people. ​Until recently she was a member of the melodic rock band Blind Fiction as a keyboard player and backing singer. Little Strings has collaborated with Tim Baugh for The Chapel Session and James Osborne and the Tea Party Party Collective..
Little Strings performed for Carlisle Fringe Festival and Manchester Fringe Festival 2017 and 2018 saw her perform in Brussels and Paris whilst touring a theatre show and driving around in a van for nine months. She writes her own songs. Little Strings collaborates with other songwriters and artists and has written for theatre shows. Her lyrics are insightful tales, philosophical (and just curious even ridiculous) questions of a twenty-something who people watches and is trying to figure life out; whether it's about tea or love; past the #authenticlifestyles and chaotic races and into the actual, real genuine world. ​And some self deprecation as well. Her sweet, vibrant voice and rich tones complement her quirky ukulele and piano playing. Her lyrics offer a poetic peak at life today in a contemporary folk and pop style. Her self-titled EP was recorded and mixed by Ben Rogerson, a producer and member of Cumbrian band The Unsung and the artwork is by Cumbrian artist and musician James Ovens.